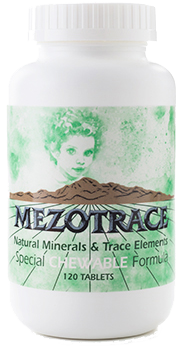 Mezotrace provides excellent mineral and trace element supplementation for everyone from childhood through old age. Soil depletion, dietary choices, pharmaceutical use, and other factors cause widespread mineral deficiency. The USDA reports that 68 percent of Americans do not consume the daily recommendation for magnesium. As reported in The Journal of Nutrition, researchers place this figure even higher, at 75-80 percent. Over the last 100 years, North American soil lost 85 percent of its mineral content, according to a 1992 Earth Summit report. This correlates with the findings reported in the British Food Journal which in 1997 reported that the general decline of nutrients in 40 foods examined over a 50-year period of analysis in the UK reached a peak of an 81 percent decrease for a single element. A good mineral balance in your system will help maintain balanced health. Calcium helps nourish blood and bone, helps develop strong teeth, stabilizes blood pressure, and combats osteoporosis. Calcium is an effective natural tranquilizer. Magnesium helps to alleviate depression, reduce high cholesterol and modify stomach acidity. It is a cofactor in 300 enzyme systems. Calcium and magnesium are two of the seven minerals essential for the functioning of the human body. Gold and copper are key elements for the treatment of arthritis. It is now believed that in a high percentage of older persons who suffer broken hips and/or legs in unexplained falls, the bone actually broke before the fall rather than as a result of the fall, due to weakening of bone structure by osteoporosis. Proper calcium supplementation, preferably begun early in life, can do much to prevent osteoporosis in later years. There is much evidence that increased calcium intake in older persons can aid in strengthening previously weakened bones. Care must be taken to provide balanced mineral supplementation; many minerals and trace elements cannot function properly unless combined in proper proportion with others. In some cases, ingestion of large quantities of a single mineral or trace element without attention paid to combining it with others can be harmful. MEZOTRACE is a naturally balanced combination of minerals and trace elements, all from a 100 percent natural source: no harmful side effects have ever been reported. Taken as suggested, it provides excellent mineral and trace element supplementation for everyone from childhood through old age.